Dana Hills finished second in league each of the last two seasons, but the Dolphins are halfway to getting back to where they want to be. Dana Hills (12-8, 4-0) has turned a corner in league play after a 4-8 stretch that followed a 5-0 start. Three of the Dolphins’ four league wins have been by 18 points or more. The other win was a five-point game over defending league champion Trabuco Hills. Dana Hills, No. 10 in CIF-SS Division 2A, is motivated by what Coach Anne Honey called “unfinished business” with those second-place finishes. On Jan. 18, the Dolphins had a dominant middle stretch in a 56-33 win over Capistrano Valley. Dana Hills scored 23 unanswered points from the second quarter into the third quarter. Dana Hills led by as much as 34 points in the fourth quarter. Sophomore Maicie Saia had a huge night with a game-high 20 points. Junior Maya McArthur had a double-double with 11 points and 13 rebounds. 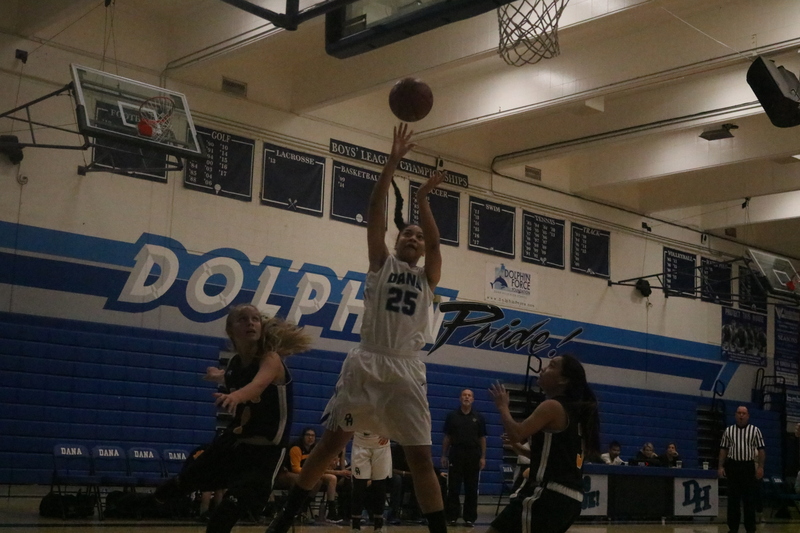 The Dolphins followed up with a 20-point win over Laguna Hills, 69-49, on Jan. 22. Dana Hills dominated the second quarter, 19-5, and fourth quarter, 21-11, to pull away. Four players got into double figures for the Dolphins. Saia again led the way with 22 points, and McArthur had a huge double-double with 16 points and 20 rebounds. Junior Olivia Chambers scored 16 points, and Junior Camille Deol scored 14 points. The results of the Dana Hills game at Mission Viejo on Jan. 25 were not available at press time. The Dolphins continue league play at Capistrano Valley on Jan. 30. Dana Hills received some stellar results in the last tournament before the postseason. At the San Clemente Rotary Tournament, Trevor Gulik earned gold in the 100-pound weight class. Erik Carreno (106), Kian Abedi (171) and Josh Harkey (182) all cracked the podium with third-place finishes. Dana Hills also got fifth-place finishes from Jesus Bruno (120), Miguel Rodriguez (126) and Jeff Wind (160). All of that added up to a fourth-place team finish for Dana Hills with 119.5 points. 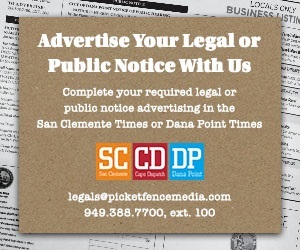 The Dolphins finished two points ahead of Santa Ana and just behind host San Clemente. The Dolphins move on to the postseason with the Coast View Athletic Association finals at Capistrano Valley High on Jan. 27. Sea View League play hasn’t been kind to Dana Hills. The Dolphins (13-10, 1-3) dropped their first two league games at home to San Juan Hills and Mission Viejo by a combined six points. Dana Hills then lost to the prohibitive league favorite and defending CIF-SS champion Capistrano Valley, 61-39, on Jan. 17. But Dana Hills got a reprieve on Jan. 22 hosting Laguna Hills. The Dolphins scored a big win, 64-37, to get their first league victory. Dana Hills has gone 4-24 in its last 28 league games with three of the four wins coming against Laguna Hills. Senior Cole Slagle led the way with 16 points, with 12 points in the first half. Senior Devin Garland was right behind with 14 points. Junior Ben Carr scored 11 points. Dana Hills hosts Capistrano Valley on Friday, Jan. 26 and Tesoro on Wednesday, Jan. 31. Dana Hills continues to get solid results in league play. The Dolphins (4-6-2, 2-1-1) picked up back-to-back wins over Laguna Hills, 2-0, on Jan. 16 and Tesoro, 2-1, on Jan. 18. The wins pulled Dana Hills into a tie with Aliso Niguel for second in the South Coast League. The results of Dana Hills’ match against San Clemente on Jan. 25 were not available at press time, but the Dolphins continue in league against Aliso Niguel on Jan. 30.